The number of undocumented immigrants living in the United States fell in 2016 to the lowest level in at least 12 years. 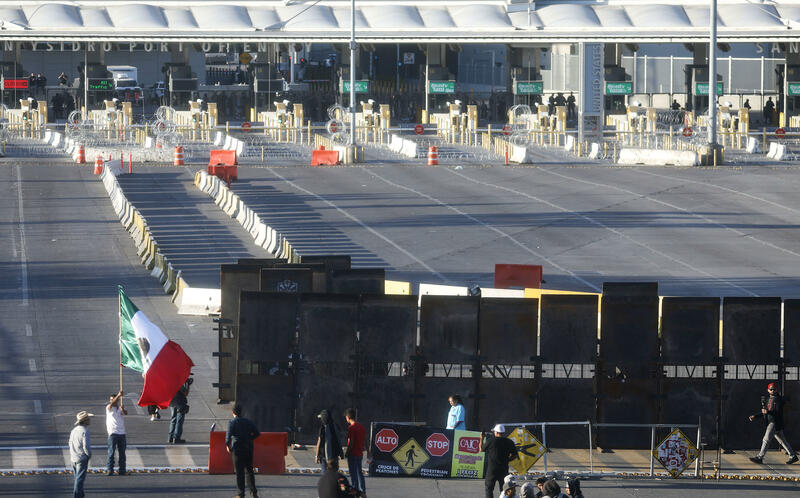 That continues a nearly decade-long decline mostly attributed to stepped-up enforcement at the country's southern border and shifting economic trends, according to the Pew Research Center, a Washington, D.C.-based think tank. As of 2016, the most recent year available, Pew estimated there were 10.7 million undocumented immigrants living in the United States, down from a high of 12.2 million in 2007 — a 12 percent decrease. It's the lowest number since 2004, according to the Pew study. Experts say that the financial crisis of 2007-2008 disproportionately impacted undocumented immigrant populations, deterring many would-be migrants from entering the country. Increased border protection has also thwarted unauthorized border crossings, particularly along the Rio Grande. "Economics and stepped-up border enforcement both played a role in driving down the number of U.S. unauthorized immigrants," wrote Mark Hugo Lopez, director of global migration and demography at Pew Research Center, in an email to CBS News on Wednesday. "The recession and housing downturn of a decade ago had a big impact on the job market for unauthorized immigrants." Much of the decline can be specifically attributed to a sharp decrease in the number of undocumented people from Mexico living in the U.S. Pew estimated there were 5.4 million unauthorized Mexican immigrants living in the U.S. in 2016, a 22 percent decline since a peak in 2007. In the five years ending 2016, a little over half a million Mexicans entered the United States. That was down from 2.05 million in the five years ending 2007, according to Pew. Because of the decease, Mexicans accounted for less than a quarter of recent immigrants in 2016, down from more than half in 2007. Most of the countries with an increase in unauthorized immigration into the United States were those from Central America, including El Salvador, Guatemala and Honduras, a group often referred to as the Northern Triangle. Immigration from these countries increased 25 percent from 2007 to 2016. A total of 1.85 million undocumented immigrants from these countries were living in the United States as of 2016. Meanwhile, deportations hit a record-high in the fiscal year ending September 30, 2018. Immigration officials ordered 287,741 new deportation last year, nearly half of which were due to "entry without inspection"; in other words, living in the United States without authorization. Immigrants from Mexico were the most frequently expelled nationality, accounting for 73,339 new removal filings, just over 26 percent of the total. Despite that, poverty and rampant violence continue to fuel migration from Central America. Thousands of people primarily from Honduras make up the bulk of the migrant caravan that's been trekking towards the U.S. border, prompting threats of a crackdown from President Trump. Undocumented immigrants from Asia accounted for 1.3 million people living in the United States in 2016, the third-largest unauthorized group after Mexico and Central America, according to Pew. Unlike their counterparts from Mexico and Central America, these immigrants are unauthorized due to expired visas rather than illegal border crossings, according to the Migration Policy Institute. "A lot of that has to do with visa overstays," said Randy Capps, the director of research for U.S. programs at the institute, in a telephone interview with CBS News on Wednesday. "It's become a larger and larger source of the unauthorized population and it's likely a majority of the new unauthorized population as opposed to border crossings." The Migration Policy Institute estimates the number of undocumented immigrants living in the United States in 2016 to be 11.3 million, about half a million more than Pew's study. The group uses proprietary methodology to determine legal status within the most recent U.S. Census Bureau's American Community Survey results. At Pew, the number of unauthorized immigrants living in the United States was determined by using the same Census data and then ascribing legal status through a combination of other demographic data, according to group's methodology. In the 2020 Census, the Trump administration wants to explicitly ask households whether or not they are living in the United States legally, the first time the question has appeared in 70 years. However, the question is being challenged in court. Depending on the outcome, it could make it even more difficult to accurately gauge the number of undocumented immigrants in the future. "If you combine the intent of that question, which is clearly political, with politics and immigration, you're going to find yourself in an atmosphere where people don't want to answer," Capps said.